This work consists of a two-sided bas-relief mural on a structure on the roof of the 4th Street City Yards. The mural was painted on forty 4’ x 8’ panels, which had an insulflex built-up surface to create textural definition and form. Acrylic paints in natural colors were used. 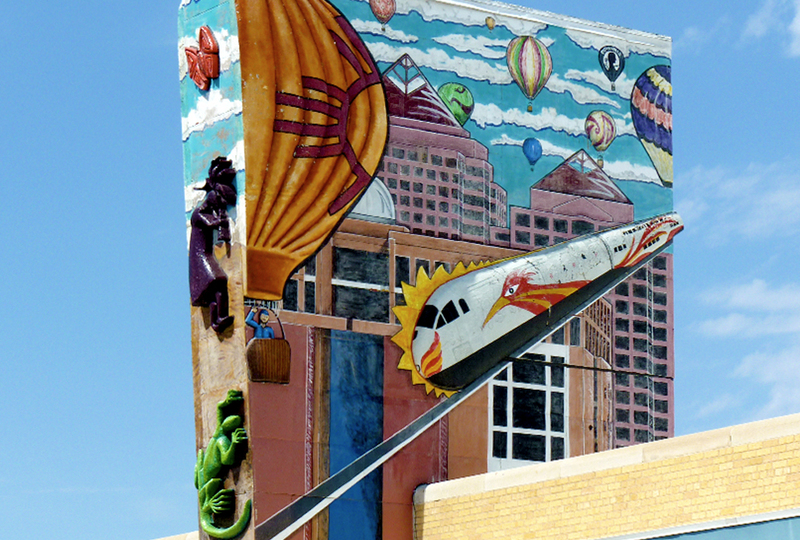 Double-sided acrylic and fiberglass were used on the mural, which depicts scenes from the Southwest. On one side a wagon is headed west along the Camino Real through the hills and brush of the desert Southwest. The other side is a modern take on Albuquerque, with skyscrapers and an elevated high speed rail. PAZ is an artist of multiple abilities and has an established reputation as a jewelry designer, sculptor, painter and Aztec dancer. The Albuquerque artist describes his current style as ranging from "traditional to futuristic." He adds, "I like to take traditional and contemporary themes and work them back and forth . . . somewhere in between lies the vision I seek." In creating his sculptures and drawings, PAZ says, "I don’t feel like I can deny my Native, Spanish or American heritages." He began his art career in 1971 and later trained other Native Americans in the art of jewelry making under a government program. During stays in Mexico, he learned the dances and traditions of the ancient Aztec empire and now leads an Aztec dance group called Ehectl (the Wind).